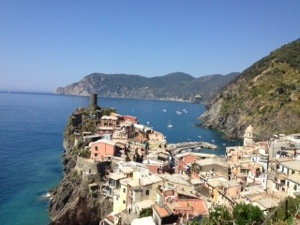 Our next stop after Venice was Cinque Terre. 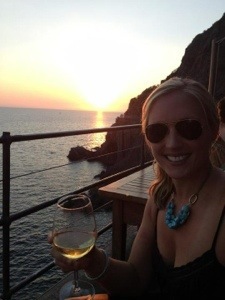 Originally, we were not planning on going to Cinque Terre as part of our trip, but one of our best friends, Ann, who studied in Italy during grad school insisted that we add it. 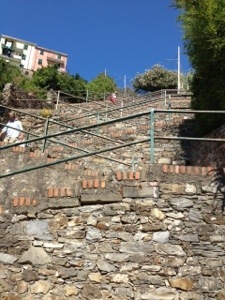 With how active Miles and I are, she wanted to make sure that we climbed Via dell’Amore. Ann is a genius, because it was the most amazing place I’ve ever been. It is five amazing cliff towns on the Ligurian Sea and there is a park system that connects the towns. 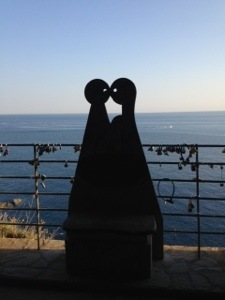 We stayed in Riomaggiore, which is the first town. Just to get to your room or to dinner, everything was uphill. When I injured my ankle and foot 6 weeks ago, I stopped running and added a lot of step mill (or what I like to call the devil) and incline walking. I’m so happy that I did that because I feel like you almost have to train just to walk around Riomaggiore. The people who live there must be so fit! We had an amazing first night there, we had appetizers and wine with the most amazing view. The next day, it was time to conquer the 5 town hike. We had mentioned to Ann how we should run the trail, and she looked at us like we were crazy and told us that it was more intense than we thought. She was right!! It took us 4 hours to do the whole thing (and one part of the trail was closed due to a mudslide last year). From the first town to the second town took about 20 minutes and was fairly easy. This is the part of the hike where they have the famous bench and all the locks of love. Once we got to the second town, we had to hop on a train to the next town because of the damage from the mudslide in 2011. That is where we realized that this hike was no joke. We were first faced with these stairs. We were a little cocky at this point and pretty much ran up the 400some stairs, and the whole time I was thinking that I was so glad I had been doing so much work on the step mill. From there, it just got more intense and more uneven terrain. I wish I was wearing a heart rate monitor because I’m pretty sure I was anaerobic for most of the 4 hours. I would have LOVED to have known how many calories I burned. Here are some more pictures along the way. The last leg took about 90 minutes and was BY FAR the most challenging part of the hike. It was also the most beautiful part of the hike. And we ended at a gorgeous beach in Monterosso al Mare where we had an amazing lunch overlooking the water, then found beach chairs and took a nap. Our original plan was to hike the trail both ways, but after the 5th town, both of our legs were shaking and we decided to relax and take the train home. It was definitely the right decision because our legs were fried the next day. It was such an amazing experience. 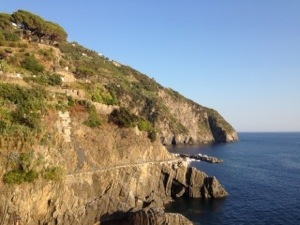 If you make your way to Italy, Cinque Terre is a must!!!! You just might want to train before you go!